Cuesta today didn't live up to my hype. In fact, it looked pretty bad when Patrick, Eric & Sharon, Jim Wells & I got to launch at noon. The wind was blowing over the back at 5-10 kts. . .
Everybody left & I hung out because I needed to fly & I'm an optimist who enjoys chillin' in the sun ;-) The wind died by 1:15, and by 2pm the cycles started coming up the ridge. I laid out & waited for a good cycle at 2:15 - I brought the wing up in a bit too strong a cycle & got the wing and lines a bit tangled in high scrub and spent 30 min. getting it cleared with the care a new wing with comp lines deserves. I finally got everything inspected & was in the air by 3. The lift was very broken & seemed to top out at 2000' (200' over launch). I spent much of the day below launch but lift was everywhere I needed it.. I made 5 or 6 circuits of the basin out in front of launch at times down to 200' above landing in the fields down by the Eucalyptus grove. The most dependable lift of the day was over the spot where I eventually top-landed. I flew for 90 minutes before top landing. Because the height of lift was so limited, it was a constant battle the whole time with little time to sightsee. There was still lift when I landed around 4:45pm. My flight is HERE. As I hiked up to my truck, I passed a young couple parked up by my truck, they asked about my flight. We talked for a bit & it turns out he had just asked her to marry him & she had accepted. I wished them well & wondered, as I hiked to my truck, how anybody could look happier than those two did. . .
My XC Skies forecast indicated that today might be good at the Cuesta Ridge. . . It was. The winds were light from the SSW and lift was 400-600fpm. up to 4000'. I launched around noon and promptly dropped 300' below launch before finding my first good climb of the day. Patrick & Eric launched about then and we all flew around the ridge. I was higher & able to get some good high climbs over the high ground, so I pressed NW along the ridge. HERE is my flight. Soon I was farther North than I've ever flown from the Cuesta launch and in excellent shape at around 4000'. The climbs were very good along a line of convergence along the ridge & I was finally looking at the choice of either pressing out towards Highway 1 (and an easy landing and retrieve) or crossing Highway 41 and potentially landing in the Hwy 41 corridor. I was a bit worried about the winds in the steep, narrow Hwy 41 corridor, so I opted to head out front to the small hills next to Hwy 1 & towards Morro Bay. My GPS was not supplying me with wind velocity information today (bugger!) so I was estimating 5-10 kts. of wind from the SW at altitude & W near the surface. I found some weak lift & ridge lift as I got low & worked out to about 1/2 mile from Hwy 1 at San Bernardo Creek Rd. The landing was textbook & I was able to catch Mary at home & talk her into giving me a lift back to launch. Patrick & Eric stayed a bit closer to launch & were hiking back to their cars at the top. Since I hadn't done any exercise for the day, I had Mary drop me off at the beginning of the road to launch & hiked up to my truck. A great day & fun flying. This weekend was the second installment of the '08 BAPA Series. I missed last month at Potato Hill so this was my first. It was also my first opportunity to fly my Avax XC2 against other pilots. Results will be HERE soon. I arrived on Friday after picking up Jack B. (from Anchorage) at the Fresno Air Terminal. We met Celia & Patrick from the Bay Area & all got in some flying. The weather was great and lift was good to about 2000 meters. We all did a nice circuit around the valley. Saturday morning the pilots all met at Dunlap School. The turnout was impressive with pilots from all over the West. The talent was deep with 6-8 top-twenty US pilots and many other talented pilots in attendance. A 99km task was called with the usual valley tour and then a 20k leg to Sandy Creek in the hills towards the San Joaquin valley and a long leg to Porterville. I launch early to get some more time on my wing (I only had 6 hours on it) and explored the normal lift producers prior to start. I had a great start and stayed with the leaders for a few turnpoints before losing contact and flying with the second gaggle. After tagging hill 49917, I headed across the Dunlap valley and towards Sandy Creek. I saw Jug & Tom coming towards me at a lower altitude so I pushed on, hoping we could collaborate. Jug was lower & had to land. Tom and I worked some ragged, weak lift together for awhile but Tom moved North. I hung in the ragged lift until it consolidated into a nice 2-3m/s climb to 1900 meters. I pushed back to a ridge that ran towards Sandy Crk and found good lift along the way. The turnpoint was in the flat & I glided towards it when I got hammered by sink about 2k from the turn. I decided to overfly a small 300' 'bump' prior to the turnpoint hoping that I would get a bubble over it. No luck - so it looked like a death glide to the turnpoint. In addition to my concerns of impending landing, I was getting flaky readings from my GPS - it was getting spotty reception and actually said I crossed the turnpoint when I KNEW I was at least a kilometer from it. I pressed on until my back-up said 400 meters and made a desperation turn back to the 300' bump, which now was at my height. I was able to get a bump from the bump and soon was climbing to 1800meters. 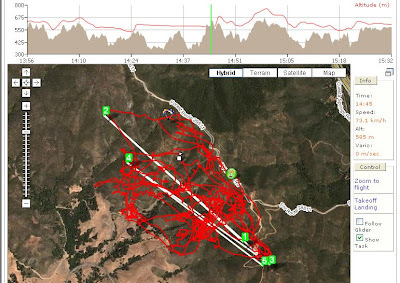 As it turns out, my GPS track from my primary was very fragmented so I used my backup tracklog. Unfortunately I had set the recording interval at 5 seconds so no trackpoint was inside the cylinder at Sandy creek. This was one of many technical problems encountered by pilots this weekend. It is good to get these problems out of the way before the main comps, later in the season. No one made goal today. Jack B., Josh, Eric, Dean, and Mike F. had the longest flights and I was right behind them. Sunday was a carbon copy of Saturday. Lift was punchy and strong to 2000 meters. 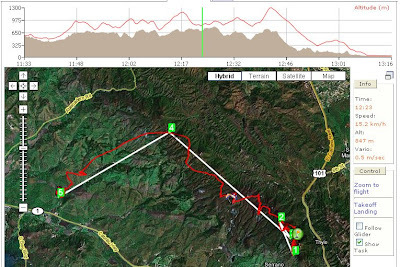 The course was similar to Saturday's with the last leg to the school rather than down valley. I launched early again and flew with Nick G. for 45 minutes before the start. I headed back to the start cylinder and found a bullet that put me at the top of the heap in great position for the run to Hill 49917. I stayed in contact with the leaders again until I found a hole coming back from Last Chance. I got stuck low on the main ridge and had to ridge soar until I was high enough to turn a circle in the thermals roaring up the side of the hill. I made some mistakes this weekend. I found myself alone between gaggles too often. I need to really work at staying with the leaders, even if lower than them. The Avax XC2 has the performance to really hang in there & I am getting familiar with the techniques that are effective in controlling the wing. 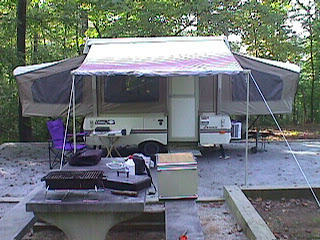 This was also my maiden voyage with the pop-up camper. It was very comfortable for Jack & me. I will definitely be staying in it for the comps this summer. Thanks to Chris Hilliard for the photo of my launch. The weather hasn't allowed for much flying for the last 2 weeks. My AVAX XC2 is patiently waiting in its bag for me to give it a chance to fly. I've taken this opportunity to work on my 1987 Starcraft pop-up tent trailer. This new acquisition is a cheap, comfortable, fun, and convenient answer to the question, "Where are you going to stay during the competition?" The camper can be set-up in 15 minutes and sleeps 4 comfortably and 6 in a pinch. It has a sink, 2-burner propane stove, and a self contained 12v. electrical system. I've spruced up the bunk mattresses so they are as comfortable as any motel. All it needs now is a 12v. blender to make margaritas . . . I plan to spend as many as 24 nights in this rig over the summer. I've also posted a list (on the right side of the blog) of 'articles' I've written this year. The first is just a compilation of responses to a thread I started on the PG Forum from competition paraglider pilots who were willing to provide some tips. 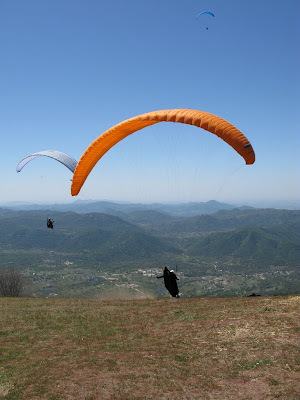 The next is an article I wrote for the USHPA magazine, HANG GLIDING AND PARAGLIDING. It was published a few months ago. It offers some recommendations for survival kits to be carried on XC flights. Yes, I do actually carry what I talk about in the article. Finally there is a link to a Competino / 5020 Cheat Sheet that I wrote over a year ago. A large number of these integrated GPS/Vario units are on the used market now & maybe, this document will help some of the new users. It was written for the older firmware, but most of the procedural info is still valid.